The card deck is something like a scrapbook for your trading cards and coupons. There are two ways to open your card deck. You can either use the menu bar on the left of the screen, or go to Cards -> Card deck. The cards are sorted into the deck, grouped by category. The cards are stacked, with the number showing the amount of cards you have. Some cards might have a lock symbol on them. Those cards come from promo booster packs, and those cards can not be sold on the bazaar. You will also see spots with greyed out cards. Those are cards that you do not own yet. You can buy those on the bazaar or directly from the card deck, you can do this by simply clicking on the instant buy button below the card. 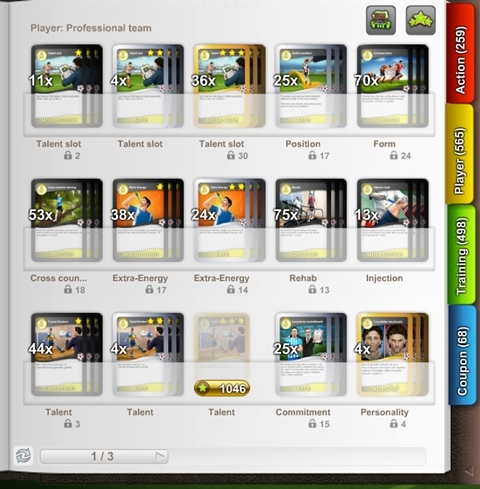 Double clicking on any of the cards (including those you do not own yet) opens the card menu and gives details about their function.